For those of you who haven’t heard my yelling in the wilderness before now, allow me to yell some more: I thoroughly enjoyed the Ang Lee directed “Hulk” and still think it’s one of the best superhero movies made. For years fanboys whined that superhero movies weren’t treated with the respect or dignity the characters deserved. Well, they got a movie with an intelligent script, an A-list director, a top notch cast, photographed with style and imagination and what did they do? BMW’ed that there wasn’t enough “Hulk Smash!” They certainly can’t say that about THE INCREDIBLE HULK as there’s enough action in this one to make up for any lack of action in the first. And it’s well directed action that serves the needs of the story and just isn’t put in there for “Hulk Smash!” value. I enjoyed THE INCREDIBLE HULK for a lot of reasons I like “Hulk” They both share intelligent scripts, a top-notch cast and it’s photographed with style and imagination. I don’t know if Louis Leterrier can be considered an A-list director but if he keeps on making movies this good, he will be. THE INCREDIBLE HULK hits the ground running by giving us a condensed, reworked version of The Hulk’s origin. In this one, General Thaddeus ‘Thunderbolt’ Ross (William Hurt) enlists the genius of radiation expert Bruce Banner (Edward Norton) to revive a World War II era experiment: The Super-Soldier Project. The idea is to physically enhance human beings to the pinnacle of peak human perfection. If you’ve seen “Captain America” then you know how that worked out. Ross thinks that Bruce can speed up the process. Well, Doc Bruce Banner gets belted by gamma rays, turns into The Hulk and in the process injures not only Ross but his daughter Betty Ross (Liv Tyler) the love of Bruce’s life. Now, when Bruce gets angry or outraged a startling metamorphosis occurs and he changes into a seven-foot tall, thousand pound, green skinned powerhouse driven by rage. Bruce goes on the run, hiding from Ross and the United States Army while trying to find a way to control the raging spirit that dwells within him. We pick up Bruce working in a bottling plant in Rio de Janeiro. He’s studying martial arts to help him control his anger. He’s working on a cure for his condition with the help of the mysterious Mr. Blue who he communicates with via laptop and satellite uplink. Ross finds Bruce due to a set of circumstances involving a cut finger, a soda bottle and the second funniest cameo Stan Lee has done in these Marvel movies. Ross sends a team of Special Forces commandos to capture Banner. They’re led by Blonsky (Tim Roth) a Russian born British black ops type of guy who’s past his prime. The team finds Banner and they make the mistake of making him mad so you can guess what happens after that. But Blonsky wants another crack at capturing Bruce and The Hulk and willingly volunteers to take the Super-Soldier serum himself so that he can have a fighting chance against The Hulk. In the meantime, Bruce and Betty have reunited and decide to go to New York to seek out Mr. Blue themselves. That plan is complicated by Ross, Blonsky and The Army showing up and in one of the movie’s really amazing battle sequences Bruce Hulks out and takes on the Army and Blonsky. Blonsky’s able to actually hold his own for a while against The Hulk before the big green guy shows exactly why there’s ‘The Incredible’ in front of his name. The fight leaves every bone in Blonsky’s body shattered but in a few hours he’s totally and completely healed. This gets Blonsky to thinking: if he’s like this just from having taken the serum, what’ll happen if he gets a dose of gamma rays like Bruce Banner? The answer leads to a simply fantastic showdown in New York’s Harlem between The Hulk and Blonsky who has been transformed into a gamma powered Abomination. But will Bruce be able to find a lasting cure? Will he and Betty ever be able to have a normal life? The really fun thing about THE INCREDIBLE HULK is that it follows the old school formula of storytelling that Marvel did so well way back in the 60’s/70’s: a healthy dose of plain ol’ superheroics with just enough soap opera elements to give the characters and the story the illusion of being something more than just the opportunity to have guys with bulging muscles whomping the piss outta each other. But it’s done so well and with such respect for the source material that like “Iron Man” and “Fantastic Four: Rise Of The Silver Surfer” it’s elevated out of just being just another superhero movie and is A Good Movie, period. I liked Edward Norton a lot in this movie. He’s one of the best actors working today and his Bruce Banner really isn’t that far from the way Eric Bana played Banner in the 2003 movie. Norton’s Banner is less repressed and more proactive but five years on the run from the government will make a man come out of his shell real fast. I liked how even General Ross had to admit that Banner isn’t to be underestimated and not just because he can turn into The Hulk. This is a Bruce Banner who in his own way can be as dangerous as his monstrous alter ego. And speaking of General Ross, William Hurt did a far better job of playing ol’ ‘Thunderbolt’ than I thought he would. It’s almost a shame he had to follow Sam Elliot’s definitive performance as General Ross because I think if William Hurt had done it first, we all might be saying that his version of Ross is the definitive one as William Hurt is just that good. And saying Tim Roth is a terrific actor is as obvious as saying water is wet. It’s just a given that in any role, Tim Roth is going to do his usual excellent job. The only acting disappointment in the movie was Liv Tyler. Not that she’s terrible as Betty Ross. Far from it. She’s quite good. Just not as good as Jennifer Connelly. The CGI Hulk in this one is an improvement over the 2003 version. He’s way more muscular and it looked to my eyes as if the CGI guys tried to find a medium between the gray and green versions of The Hulk in that there are some scenes where he looks greener and others where he looks grayer. In any case it’s a more natural looking green and this Hulk is a truly terrifying creature. I’ve always considered The Hulk’s arch enemy to be the entire United States Army and in the comics The Hulk had some truly epic battles with them and so he does in this movie. And the final fight between The Hulk and Blonsky/The Abomination is jaw-droppingly awesome in its sheer savagery. So should you see THE INCREDIBLE HULK? Chances are you probably already have. I’m not even going to get into which is better, this one or the 2003 “Hulk” I like and enjoy each of them for what they are. Both are extremely well made movies with valid interpretations of the source material. 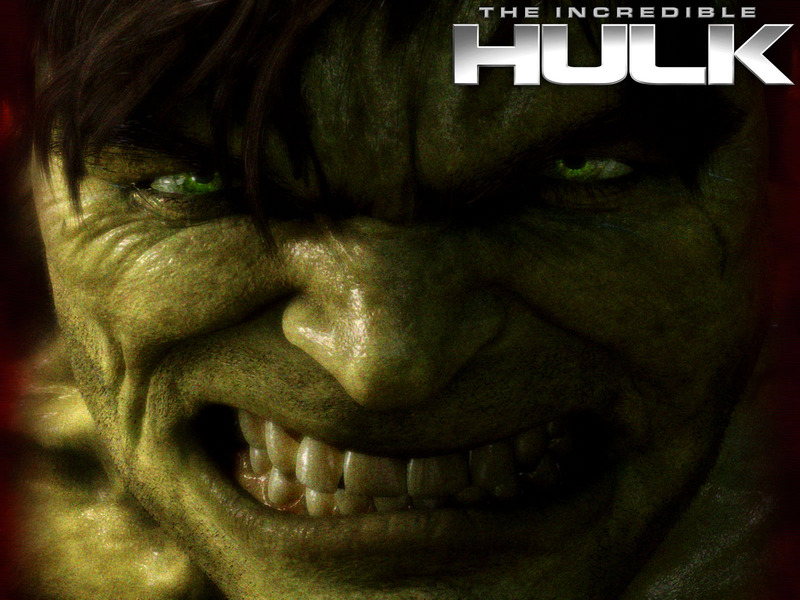 There’s a whole lot of references and nods to the comic book, the TV show starring Bill Bixby and Lou Ferrigno as well as the animated ‘Hulk’ series from the 80’s and 90’s that will give long time fans a chuckle and there’s more than enough action and character drama to ensure a good time at the movies will be had by all. Enjoy. Hmmm, but you liked the first one? I couldn’t finish it. My vertigo kicked in with the annoying stylized fades that Lee used to give the feel of a comic book. I don’t mind a cerebral movie, but when the first appearance of the Hulk is simply him Hulking out and then running off into the night, you have a problem. Years of no live action Hulking out and his first appearance is running away? Bad move.